My mother never took us to church. She took us to Sunday school, but I don’t have any clear memories of going to church. However, I have handfuls of memories of my cousin Eddie taking my brother and I. I’d giggle as my brother would whisper to me, “Give us this day, our daily bread, and add some peanut butter and jelly, and make a sandwich.” Okay, so it was hilarious if you’re five years old. Actually, anything my brother said to me was hilarious, I was his shadow. I come to sit and write for just a moment because I had such a good laugh, and I’m not sure what was even so funny. As I just reflected back on this moment, I guess I began laughing at how you can just follow someone. Especially as children, we just completely trust someone that is leading the way. So I followed my grandmom to stand in line at the front of the church. I followed her back to the pew. The next thing I remember is the disgust of the elderly couple’s faces as I spit the Eucharist out all over. “Yuuuucckkkkkkk…..” Oh the horror. Too Funny: I found this picture just moments after writing this story. Moving from memory to memory: my mother is yelling at my grandmother, who is deaf, mind you. 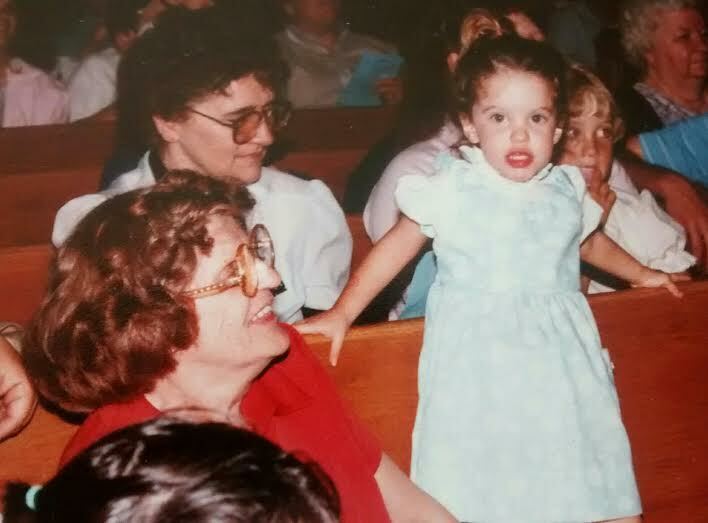 “She didn’t have her communion yet!” ::Yelling, yelling, yelling:: My mother was heated, and was going at it. Today, as this memory crossed my mind, I had a good laugh at the whole situation, and I’m not even sure why. I mean, my mom was an Atheist at the time, so why did she care? And my poor, deaf, elderly grandmom: she was the church-goer. It probably blew her mind that she just committed a crime: subjecting her own blood to the Body of Christ, without penance. Hmm, maybe it was a good thing I spit it out, but seriously: how many sins does an innocent, five year old have? My moral of the story: Even if the situation at hand might make you angry, or scared, there might be a third force in the room that is getting a good laugh. Previous articleTrigger Point/ Tension/ MassageTriangle to Triangle: Excruciating Neck Tension Released!